Why one-handed shooting is a skill you need in the real world. Your one hand may well be holding something valuable (Mr. Potato Head, in this scenario) while threats need to be shot. Using both hands to shoot a handgun is without question the best way to ensure making good hits. As to which of the many named techniques to use--Weaver, Isosceles, Modified Isosceles, cup and saucer--or simply grabbing the gun with two hands--all produce better hits on target compared to using only one hand. The problem, however, is that in many circumstances using two hands on a handgun is counterproductive to successfully defending yourself against a real-life threat. 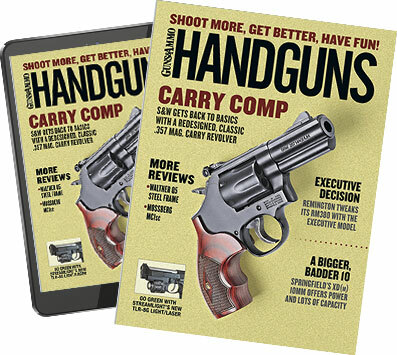 Once you remove yourself from the practice range or action pistol competitions where the two-hand hold reigns supreme--with but few (and well-needed) exceptions--you can easily think of real-world situations in which you would be fortunate to get either hand on your defensive handgun, let alone make a perfect shot one-handed. The most obvious scenario that comes to mind is engaging a threat at conversational distance--no more than an arm's length or two apart. Such situations are the norm, not the exception. After all, the threat needs to convey his intentions to you, and it's not likely this will happen from across a parking lot. Up close, you may not even have room to use a two-handed hold, particularly if the threat is attacking you. Sometimes the best you can hope for is just being able to get your gun in one hand and fire it. Also, there's a good chance the threat will not be positioned directly in front of you and you will have to fire one-handed from a less-than-optimum shooting stance. Other very real assaults occur when the intended victim is opening a door, carrying packages or otherwise occupying one or both hands. If you have not practiced such shooting, your chances of getting good hits are slim to none. Other instances include moving in dim or no-light conditions, where you want to keep one hand free so that you can avoid doors, walls or other such obstacles. Your off arm also provides needed balance over uneven ground and when ascending or descending stairs. Then there's using a flashlight. Again, the two-handed flashlight-and-gun methods are best, but they can easily put you in an awkward position for effective movement. Angles of fire are limited by how well you can turn your torso and your entire body. What is needed is, at a minimum, some one-handed familiarization fire from awkward shooting stances--and practice with either hand. When you do such practice, keep in mind you are working on two skill sets: first, simply learning how to control and fire your handgun in various directions with one hand; and second, after you become acclimated to doing so, learning what to expect when you shoot. If this is all new to you, then dry-fire work is mandatory, for it is all too easy to fire before the muzzle is safely directed. After sufficient practice, you can switch to live fire at a very close target that you almost can't miss, since the goal now is to learn how the gun feels and operates when shot one-handed. Only after you've mastered close-quarters one-handed shooting is it time to work on getting centered and multiple hits on one or more targets. Still keep the target or targets close, because if you have distance you should have time to get into a better position. Next, change hands. And start over from the beginning. The last step in the exercise is to fire while doing everything incorrectly. Whatever you found that worked best, do it incorrectly. Bend your arm so the gun is not well supported, shift your weight back on your heels, fire the gun when it's not aligned vertically. Many shooters mock anyone on the range holding a gun in the so-called "gangsta" style, with the gun positioned horizontally. But, in reality, bullets don't know or care whether or not the handgun is held "funny." If this is the hold you are forced to use when firing in an unconventional position, you need to learn to get hits with it. Now you'll know what to expect in the worst case, while keeping in mind that a hit, however poorly placed, is better than a miss. And at the same time, instead of waiting to make the "perfect" shot, you won't hesitate to fire. Most likely your handgun will malfunction while doing some of these drills. A better grip cures some malfunctions, but others just happen. Not the fault of the gun or you. Stuff happens. Fix it and get the gun running again as quickly as possible. As far as using sights, to me this is a non-issue. You'll use as much sight or not as you need to or can get from the various odd shooting positions. The point is, you'll know what to expect. Learn to handle your gun in non-standard, non-ordinary conditions until those conditions become standard and ordinary.